This 16" Dovetail Saddle Plate, designed and manufactured by Astro-Physics, is the ultimate in versatility for customers with instrument packages that are difficult to balance in conventional saddle plates. A total of 8 mounting positions are available to provide a "best possible" orientation for either front-heavy or rear-heavy instruments - especially useful for today's heavy imaging configurations. This plate has an inherent 8" (20.3 cm) total offset capability, depending on how you position it on the mount. Due to the addition of a third, center clamp, the DOVELM162 can now maintain at least two clamps engaged on any Losmandy "D-style" or other "D-style" dovetail plate 7" or longer. As with all of our dovetail saddle plates, it is very easy to attach dovetail plates. Simply tilt your D-style plate, with the scope attached, into position. Then tighten the knobs. There is no need to struggle as you try to insert the Losmandy plate (with your heavy telescope attached) into the end of the dovetail saddle, as with some saddle plate designs. Warning: For several years, beginning approximately 2004 for an unknown length of time, Celestron delivered their scopes with a dovetail mounting plate that had a different specification. These plates do not anchor securely in the DOVELM162. We encourage everyone using an older plate manufactured by Celestron to test that plate in the DOVELM162 before mounting their telescope, in order to ensure that it can be locked down firmly. The DOVELM162 features 1" diameter knobs with 3/16" hex sockets, allowing an Allen wrench to be used for extra tightening when carrying a heavy load. The smaller design of the knobs prevents interference with the Dec motor box when the plate is mounted in the extreme offset position. The smaller knobs also avoid interference when used on the 22" or 27" sliding bar for the 3600GTO (SB3622 or SB3627) in a side-by-side configuration. The clamping blocks grip your dovetail plate firmly. Springs keep the blocks in an open position until you tighten them. The unique design of the clamping blocks ensures that they remain properly aligned with no need for additional guide pins, and the brass washers on the knobs allow firm tightening with no binding. This plate includes wide recesses to accommodate the safety knobs of the Losmandy D-style plates. It also features multiple machined cutouts on the underside to reduce weight. The DOVELM162 can be attached to the top of your Astro-Physics rings using riser blocks and a hole-spacing length of 13.75". 10-32 tapped hole at each end allows for cable stays to be installed for cleaner routing of accessory cables. 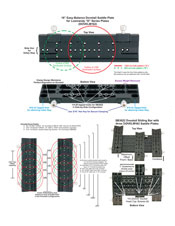 Possible configurations with the 27" Dovetail Sliding Bar for the 3600GTO (SB3627). Notice: Please note that older styles of this saddle plate utilized a larger diameter knob which will not work with the new, wider SBD16 dovetail plate without installing additional washers. Alternatively, we do offer the newer style knobs (SDOVE162KB), which include a 3/8" socket screw, as a replacement.